Finding Marriage of Elizabeth Smith Julian and Newton Bonner in 1840s Kentucky, North Carolina or Tennessee? John Robert Bonner, was born in Missouri, on May 19, 1845. 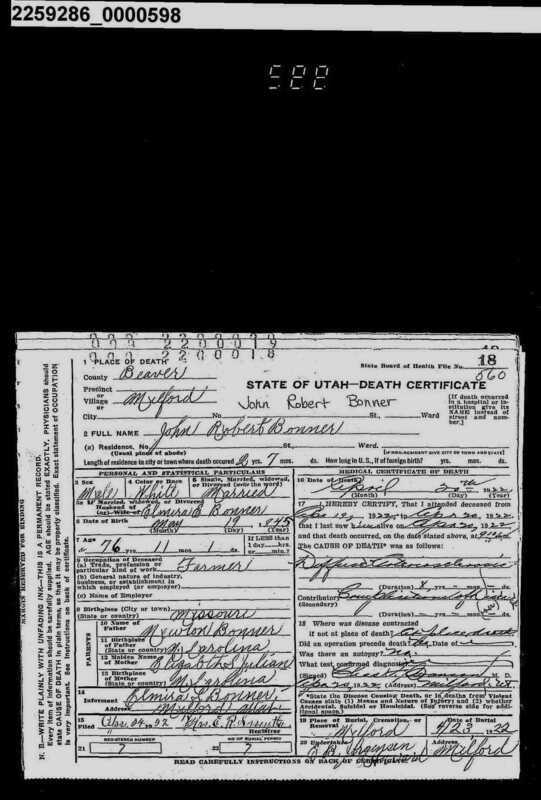 His father, Newton Bonner, was born in Kentucky and I don’t know the year. His mother Elizabeth Smith Julian is the Daughter of John Julian and Lucinda Burrow Julian Ratliff Born 1828 in North Carolina according to census records. Apparently several families in Tennessee were thinking of moving West and in 1843 Newton Bonner made a trip to California and back. Upon his return, they started West into the area of Texas and then turned North with the intention of going to Missouri. He was what, at the that time, they called a “Scout Master” He would ride ahead of the wagons each day checking the trail and finding a camp site for the night. No one knows what happened to him, but he rode out one morning and they never saw him again. Newton Bonner disappeared somewhere in Missouri in 1845 and just a short time before his son John Robert Bonner was born. 1853: Married LaSalle, Ottawa, Illinois to "2nd husband Elihu Robinson McCord"
Newton and Elizabeth's marriage could have been in Kentucky, North Carolina or Tennessee. Where might I find their marriage record? Browse other questions tagged marriage-records 1840s tennessee kentucky north-carolina or ask your own question. Tracing male ancestor born late 19th century in North Carolina? How to interpret Quaker dates entered after 1752 but referring to before 1752? Are parents listed on marriage certificate “proof” of parentage? Finding residence information for Toronto in the 1840s? Finding first marriage of William Franklin Greenfield of Patterson, Caldwell Co., North Carolina, USA? Resources for researching family from Greene County, Tennessee? What does Orring County North Carolina mean in Quaker records? Who was the Jackson Moore named in the 1838 will of Zachariah Green?